So ... sunday again. How do you spend that day? I hope it was a good one for all of you. Mine was pretty lazy ... just what I needed. But how can I forget that it's Cazekiel-Day again ??? 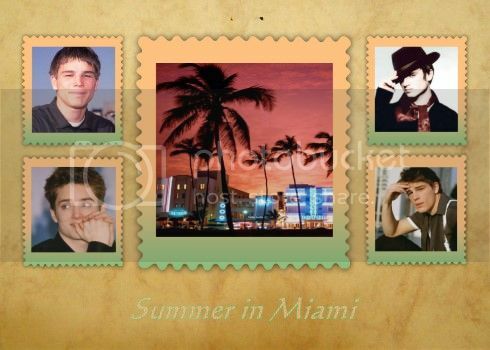 So, have a bit more about the boys in Miami. After a plate of scrambled eggs with toast, some fresh fruits and coffee Casey started to relax visibly. When he finally put off his sunglasses Zeke smiled. Casey noticed his look and frowned. And he couldn't hold back. Casey slightly blushed but smiled. “I'm afraid you're wrong,” he said. “You can go to the best Colleges, Casey. You can learn every law inside out. But this doesn't make you a good lawyer. “Has he ever had a look at your pictures,” Zeke asked. Zeke looked up surprised, a slight disappointment was rushing through him. Suddenly Zeke felt anger rushing through him. My dad this … my dad that … was he not able to make own decisions? It was his life and no one had the right to tell him what to do with it. Not someone as selfish and small-minded like his father. He needed to free himself out of his clutches or one day he would end swallowed up by a world which wasn't his. He couldn't say why suddenly the memories hit him out of the blue. A little boy, about five years old. He had spend the day with making a card for his dad, with glitter and hearts and stuff. When he heard him coming home in the evening he run to him to gave him his present, so full of proud. He didn't even need to close his eyes to remember the stoney face of his father while he eyed the card for a while, finally he shoved it back to him and said: Try it again, Ezekiel, you can do this so much better. He hadn't thought about it for so long. No, Casey was not the only one who did grow up with an overpowering father. Like Casey Zeke had build up a shell around himself but he had never been the obedient son who tried everything to satisfy his father. He had rebelled against every kind of authority, more than once he had gotten himself into trouble. And the more his dad freaked out the more he had enjoyed it. It had taken almost twenty years until he realized that it was time for his own life. His eyes were thoughtfully resting on Casey. He was still not sure about what he was going to do, but maybe this was his last chance before Casey would leave Miami. “Tell me, Casey, how old are you,” he asked … as if he didn't know. “He just wants my best,” Casey protested weakly. Casey looked almost shocked as if the thought alone was a sacrilege. All too long he was following his father's wishes and had put back his own dreams. The thought to stand on his own two feet was bewildering and frightening. But Zeke could read in his eyes, how much he longed for doing this step. “When I'm not going to Stanford, but stay back in Ohio and go to a local art school, he will kick me out of the house,” Casey finally answered. Zeke chuckled at Casey's dumbfounded face. “I'm not like that,” he murmured. For a moment Casey looked stunned, then a smile sneaked on his face. “I would like to go to New York,” he admitted. “You could stay with me … at least for a while,” Zeke said. Zeke is so right about what Casey needs to do to be happy. I love that he is in a position to help Casey if he decides to apply to New York. Yes, it's about time that Casey starts to think about his own wishes. He's not the little boy anymore who should follow his parents wishes no matter the price. It good, that Zeke is there to help him. Oh, I like how Zeke helps to get Casey to dream a bit and realize that he has options. It's sad that this fic describes a lot of real life situations in which children don't realize they're living their parent's dreams, not their own. Yes, this is sad, Casey is grown up but he still needs to realize that he's not the little boy anymore who needs to follow his parents rules and wishes. It's okay to look for his own way. Just good that zeke is there, willing to help him to realize all that.